Ben & Jerry's is bringing four of its Greek Frozen Yogurt flavors to Israel instead of the two new dairy ice cream flavors it usually introduces in the country once a year. 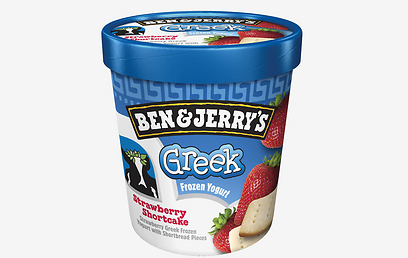 In the United States, the Greek Frozen Yogurt series includes seven flavors, building on the popularity of the Greek yogurt category in the country. The yogurt is not particularly sour and is marketed as a health product. The flavors offered in Israel are Strawberry Shortcake, Banana Peanut Butter, Raspberry Fudge Chunk and Blueberry Vanilla Graham. Other flavors available in the US include Vanilla Honey Caramel, Pineapple Passion Fruit and Liz Lemon, inspired by Tina Fey's character in the "30 Rock" comedy series. In the past, Ben & Jerry's marketed in Israel a flavor called Cherry Garcia in its frozen yogurt version. The flavor was recently taken off the shelves in Israel and is not considered part of the Greek series. The Greek Frozen Yogurt tubs are slightly smaller than Ben & Jerry's dairy ice cream packs marketed in Israel. The weight of the 473 ml tub ranges between 392 to 400 grams (13.8-14 ounces). "We will introduce 500 ml tubs when we start making them in Israel, but first we want to see how the products are received here," Avi Zinger, CEO of American Quality Products, which manufactures and markets Ben & Jerry's products in Israel, told Ynet. According to the company, the Greek Frozen Yogurt products are priced like the dairy ice creams – "NIS 22-24 ($6-6.5) per tub," according to Zinger. The company has been marketing the ice creams in the past year or two as part of special sales, mostly two for the price of one. "Because we manufacture all Ben & Jerry's ice cream in Israel, we were forced to make our own real Greek yogurt at our factory in Be'er Tuvia, as there was no such raw material available in Israel," explained Zinger. "We are importing the containers at the moment, until we learn which of these flavors becomes popular in Israel." Another difference between the dairy ice cream and the frozen yogurt is in the nutritive values. Ben & Jerry's is one of two companies in Israel marketing ice cream in whose main component (80%) is cream. The second company is Häagen-Dazs. The frozen yogurt products have 30% yogurt, meaning that they are lower in fat and contain more milk protein. According to the nutritional information on the products' containers, the Greek frozen yogurt has 8-5 grams of fat per 100 grams compared to 13-15 grams of fat in the company's dairy ice cream and up to 23 grams of fat in dairy ice cream containing nuts. The dairy cream has 240-340 calories per 100 grams compared to 180-210 calories in frozen yogurt. The yogurt has more protein (6 grams compared to 3 grams in dairy ice cream) and more calcium (150-200 grams compared to 100 grams in dairy ice cream). So what does it taste like? It's similar to ice cream yet with a pleasant yogurt aroma and a softer texture, and of course with generous chunks – Ben and Jerry's specialty. The Israeli company sells 14 Ben & Jerry's flavors in Israel in family packs (as well as different ice cream bars) and generates NIS 50 million ($13.5 million) a year. It also exports ice cream to the US Army. In the past, the company exported to Singapore and all of Europe, but stopped following the move to the Be'er Tuvia factory. "We hope to renew exports soon," said Zinger. "Our goal is to expand the audiences consuming Ben & Jerry's to consumers with healthy eating habits who also wish to spoil themselves. "In the US, the company managed to reach new audiences which did not consume its products. Some 47-48% of the consumers of Greek Frozen Yogurt in the US don't even buy premium ice cream and didn't buy Ben & Jerry's ice creams before." What market share would you like to reach in Israel? we make up 12% of the ice cream market, while in economy packs we make up 17% of the market. The company generates NIS 50 million a year in Israel and we expect the Greek Frozen Yogurt sales to reach NIS 5 million ($1.4 million) by the end of the year." Will it be easier for you to get the new products into supermarkets' freezers? "It won't be easy. We've had the same limited area in the freezer for years, despite the fact that we're only growing." 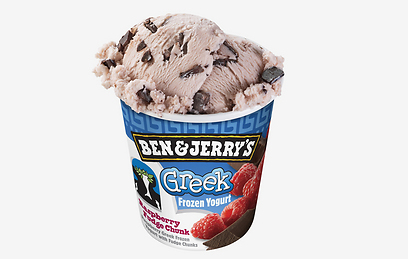 See all talkbacks "Ben & Jerry's Greek Frozen Yogurt in Israel"